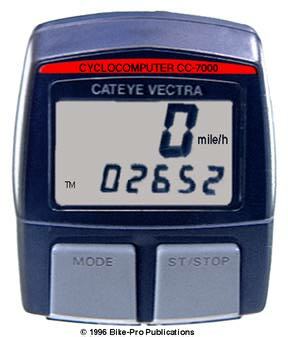 The Cateye Vectra is slick, lightweight, compact and basic. It's waterproof, and has 6 functions derived from a fork mounted wheel sensor. All distance readings can be displayed in Miles Per Hour or Kilometers Per Hour, though we will speak in MPH. The Vectra uses a two line Liquid Crystal Display, the top line is 10mm high and used for speed display functions, the bottom line is used for mileage and time functions. With the Vectra your current speed, up to 65 MPH, is always displayed on the upper line, with any of the other 5 functions available simultaneously on the lower display line. It has a resettable trip meter to display your trip distance. There is a stopwatch that will display your elapsed time, up to 10 hours in 1 second increments, since the beginning of your ride, which integrates with the tripmeter to give you maximum and average speed during a "trip". Maximum and average speed are displayed to the tenth of a mile. Both of these figures, are measured and displayed for up to and within a 28 hour period, where after the a 100, 000 seconds has elapsed the counters are zeroed automatically, and it begins again. The Vectra's odometer will record total distance traveled up to 9999.9 miles and then reset to 0 or can be manually reset. The odometer is a lower line display with 1/10th of a mile accuracy. The Vectra has power saving circuitry, with a 3 year average battery life. The Vectra uses a 30" long wire to a front-mounted, single magnet, wheel sensor with a mounting bracket that accommodates only up to a 3/4" diameter fork blade. The Vectra's instruction manual is printed English, French, German, Dutch, and Italian, and uses one CR 2032, 3 volt Lithium battery. The Vectra can be quick programmed for up to 28" wheels, and has a quick release handlebar mount, so the computer head can be taken with you to prevent theft. It comes complete with all mounting hardware and has a weight on the bike of 71 grams. Black, from Japan. The Vectra is no longer manufactured or available, however some replacement parts still are. 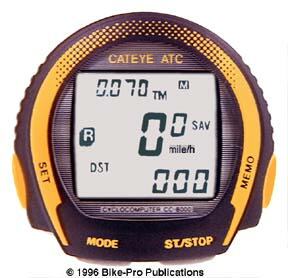 The Cateye Micro is for the person who trains seriously with an aerobic interest. This computer has the cadence function; a magnet on your crank arm, with a sensor on the left chainstay near the B/B shell, lets the main unit know how many times your cranks revolve in a minute. The basis of a real workout has always been getting your cadence steady and then increasing it's count as you continue to train. The sensor for the mileage and time functions mounts on the left rear chainstay, so it can be used on stationary trainers, for training in winter. The cadence is displayed as a whole number from 20 to 199 RPM. The Micro has a number of the "regular" features for cyclometers. The Micro uses a two line Liquid Crystal Display, putting speed and cadence functions on the 10mm upper line, and all mileage and time functions, on the lower 5mm high display line. It will display both MPH or KPH. The Micro displays current speed up to 65 MPH, which is updated and displayed every second. There is a resettable tripmeter, which displays on the lower line, the distance covered during a ride to the 1/100th of a mile. It has a stopwatch, that increments up to 10 hours then automatically resets, so your aware of how long you've been riding. The trip meter and stopwatch functions are linked, so the Micro can display the maximum speed you've achieved on the trip and your average speed, both are accurate to the 1/10th of a mile. The odometer will record total distance traveled up to 9999.9 milesincremented by tenths of a mile, then will "roll over" to zero again. The Micro uses a 19" long wire to the chainstay/BB cadence sensor and a 38" long wire to a rear-mounted, single magnet, wheel sensor, with a mounting bracket that fits all diameter chainstays. The Micro's instruction manual is printed English, French, German, and Japanese. The Micro uses one CR 2032, 3 volt Lithium battery. The Micro can be quick programmed for up to 28" wheels, and has a quick release handlebar shoe, so the computer head can be taken with you to prevent theft. It comes complete with all mounting hardware and has a weight on the bike of 78 grams. Black, from Japan. The Micro itself is longer manufactured. The ATC is down right amazing!! Using a magnetic front wheel sensor the ATC presents a wide range of options across a three line Liquid Crystal Display. The upper line is 4mm high, the middle, (main) line of the display is 10mm high, and the lower line is 5mm high. All distance readings can be displayed in MPH or KPH. It has a switch selectable auto start function, that begins to read and record all trip functions, (elapsed time, maximum speed, average speed, trip distance) when the wheel starts to move. It will also stop each of the functions temporarily if the wheel stops moving, should you stop to rest and continue where you left off when you start to ride again. With the auto function set you can accurately measure the time and distance you ride. The ATC has two trip meters, displayed on the lower line, one resettable by the user, the other is a trip distance per day function that is tied to the 24 hour clock to show how far in total, you've ridden in a 0 to 24 hour period. Both trip meters run up to 1000 miles, displayed to the 1/100 mile, then reset. The trip distance per day meter resets automatically each day at 12 midnight using the clock. 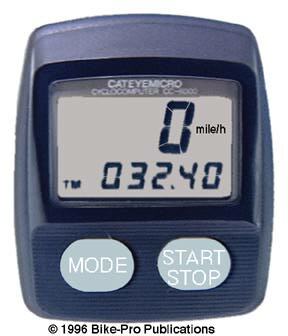 Tied to the primary trip meter, with a top line display, is a stopwatch, which runs to 10 hours, by 1 second increments. Also a product of the trip meter and clock functions are Average speed, which is displayed on the top line and Maximum speed which is displayed on the middle line, both displayed to the 1/10th MPH. Your Current speed is a middle line function, displayed to the nearest 1/10th MPH. The ATC has a 24 hour clock that is displayed at the left side of the upper line. The last of the common functions for the ATC is Total Distance or Odometer, which is displayed on the lower line, up to 100,000 miles when it resets automatically to zero. The ATC has an uncommon and highly useful function, certainly more important than say, an altimeter. The ATC has a multi function 10 stage memory to record the trip distance, elapsed time, and split average speed for up to ten separate legs, or splits on a ride. Because this function is unique to this computer, and so fundamental in personal training, it's worth discussing in detail. Let's assume that you're riding in a local State park each day, and you've found the course you use each day can logically be broken up into 4 stages, flat ground, hill climbing, descent, and flat ground again. The point that you begin the entire ride we will call point A, when you depart point A you press the Start button on the ATC, which starts the tripmeter and stopwatch simultaneously. After you reach the end of the flat ground portion of the ride, at a chosen and the same point each ride, you press the "MEMO" button on the right side of the case, at that instant, the ATC saves in separate memory, the stop-watched time it took you to get between A & B, also the distance between A & B, and your average speed between A & B. Now, you proceed on to point "C", when you get there you press the "MEMO" button again, at this point it records for display and review later, the elapsed time it took you to get from point A to Point C, the distance from point A to point C, and your Average speed from point B to point C. When you finally reach point E, which is the end of the second flat ride, you press the Start button again, and it saves your last ride segment, you can now step through each of your "splits" and review your performance through a special display the ATC has. One of these Memo splits can even be a break from riding, where it will recall that haven't moved an inch from the previous point, had a 0 average speed, but the passed time represents the time you rested. The ATC uses a 36" long wire to a front-mounted, single magnet, wheel sensor, with a mounting brackets that fit up to a 1" diameter fork blade. The Cateye ATC's instruction manual is printed English, French, German, Dutch, and Italian. The ATC uses one CR 2032, 3 volt Lithium battery. The ATC can be quick programmed for wheel sizes up to 28" wheels, and has a quick release handlebar mount, so the computer head can be taken with you to prevent theft. 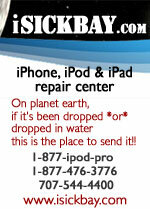 It's durable, waterproof, has an easy to read display. With all necessary hardware it weighs only 97 grams!!! The battery will generally last 3 years. Made in Japan, Black. The ATC supply is exhausted and it is no longer made. The Cateye Cordless is filled with features, yet weighs only 98 grams with it's quick release bracket and all the necessary mounting hardware. It uses a low power, broadcast transmitter on the fork mounted sensor to relay and display 7 functions, using a two line Liquid Crystal Display. The top line of the display, used for speed functions, is 10mm tall twice the height of the bottom line used for mileage and time functions. All functions are accessed through two buttons on the face of the case. It has a 24 hour digital clock, so it bottom line displays "military "time. All distance readings can be displayed in Miles Per Hour or Kilometers Per Hour, though we will speak in MPH. The Cordless displays your current speed on the top line, between 0 and 65 MPH. There is an odometer, on the bottom line display, which shows total distance traveled since installation or last manual reset. The odometer tacks your mileage from 0 to 10,000 miles in tenths of a mile reading. The Cordless has a tripmeter which keeps and top line displays your trip distance, up to 999.99 miles, incremented in hundredths of a mile, and will then "turn over" at 1000. It has a stopwatch, which is linked to the tripmeter function, displayed on the bottom line, letting you know you elapsed time since the beginning of your "trip" or ride. It will show your maximum speed since you last reset the trip meter (which records your trip distance). Your average speed is a top line display, for any 28 hour period is always available and is resettable. 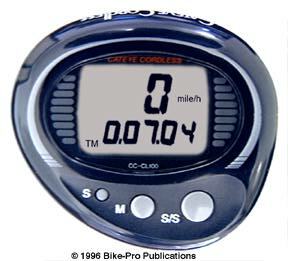 So you know how long you've been riding there is a stopwatch, which is a bottom line display, that runs up to ten hours and then resets automatically. Your maximum speed for the trip is a bottom line display. After 30 minutes of dis-use the Cordless blanks out all trip and distance functions, leaving just the clock time on the display, when starting to ride again it requires that you press either of the 2 buttons to free the computer from this power saving mode. The single instruction manual is printed English, French, German, Dutch, Spanish and Italian. The Cordless uses two CR 2032, 3 volt Lithium batteries, one each in the transmitter and computer. The transmitter should be replaced after 10,000 miles, while the computer uses less power and is good for about 2 years of average use. The comes with fork blade clamps to fit up to 1 1/4" in diameter blades, it is waterproof, just 98 grams, and made in Black only. Made in Japan. The Original Cateye cordless has been discontinued and replaced by the Cordless 2 . Cateye wheel sensor are installed, and held in place with a small Phillips head machine bolt that threads into a rear mounted brass nut. Occasionally, over time the bolt may back off and you may not realize and tighten it, in time before it drops off and is lost, making the computer useless. For those circumstances, we sell the Cateye original replacement wheel magnet. This is the magnet used for the magnet used Vectra, Mity 2, Micro and ATC computers. The 166-5120 wheel magnet weighs 4 grams. Let us say from the outset that the SpeedZone is made by Cateye, in Japan, and has the same physiacl dimensions, features and display as the Cateye Mity 2. Except for the the top of the case and the shape of the buttons used to control it, the SpeedZone is a Mity 2,...no matter what the letter from Specialized in its owner's manual says. Accordingly, the description of the SpeedZone will be near identical to the Mity 2. The Specialized SpeedZone is their first entrant in the computer market. It small, lightweight with large paddle switches that hinge at the back and toggle downward at the front, for gloved hands. The upper and lower case pieces are ultrasonically welded together making the case weather tight. 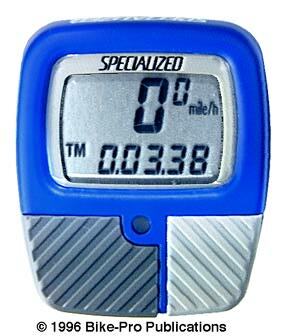 The SpeedZone has a two line Liquid Crystal Display, the upper line, which displays only your current speed, has characters 9mm tall while the lower line, which displays time and distance functions, has characters are 4.5mm tall. The smaller characters on the display is just one of the ways Specialized was able shrink the size of this computer. All speed functions on the SpeedZone can be expressed in MPH or KPH, we will use MPH. The SpeedZone continuously displays current speed between 3 and 65 MPH, to the nearest 1/10 MPH. The current speed is only upper line display, and is displayed continuously. The SpeedZone has an odometer as a lower line function, the total distance on the unit is accumulated and displayed to the 1/10th mile, up to 10,000 miles, when it resets automatically. There is a lower line display trip meter, that records up to 1000 miles, accurate to two decimal places, then resets, automatically. Also included is a stopwatch, on the lower line display, which shows the elapsed time between the starting point and the current point, up to 10 hours, displayed in whole seconds. You couldn't have a stop watch without a clock function, the SpeedZone has a 12 hour clock, a lower line function. The clock and tripmeter integrate to give the rider, Average speed over the course of the trip, and the Maximum speed achieved at any time during the trip meter operation. Both of these are displayed with 1/10th MPH accuracy. The SpeedZone has an auto Start/Stop which permits the trip meter, average speed and stopwatch functions to start and stop automatically with any wheel movement. To increase the useful battery life the SpeedZone has a power saving function, which after 60 minutes of in-operation blanks the display to the 12 hour clock only. To release the unit from this power saving mode requires that one of it's two buttons be pressed. The SpeedZone uses a 27" long wire to a front-mounted, single magnet, wheel sensor, with two mounting brackets that fit up to a 1" diameter fork blade. The SpeedZone's instruction manual is printed English, French, Italian, German, and Japanese. The SpeedZone uses one CR 1620 or a CR 1616, 3 volt Lithium battery, with an average 3 year life. The SpeedZone can be quick programmed for up to 27" diameter wheels, and has a quick release handlebar mounting bracket, so the computer head may be taken with you to prevent theft. It comes complete with all mounting hardware, and has a weight on the bike of 43 grams. The SpeedZone 1, from Japan has been replaced by the SpeedZone 2 made under contract in Taiwan.